Not to be confused with Krasnoyarsk Krai. Krasnodar Krai (Russian: Краснода́рский край, tr. Krasnodarsky kray, IPA: [krəsnɐˈdarskʲɪj kraj]) is a federal subject of Russia (a krai), located in the North Caucasus region in Southern Russia and administratively a part of the Southern Federal District. Its administrative center is the city of Krasnodar. The third most-populous federal subject, the krai had a population of 5,226,647 as of the 2010 Census. Krasnodar Krai is formally and informally referred to as Kuban (Russian: Кубань), a term denoting former Kuban People's Republic and historic region of Kuban situated between the Sea of Azov and the Kuban River which is mostly composed of the krai's territory. It is bordered by Rostov Oblast to the north, Stavropol Krai to the east, Karachay-Cherkessia to the south-east, and Adygea is an enclave entirely within the krai. Krasnodar Krai shares an international border with Georgia to the south, and a disputed border with Crimea across the Kerch Strait. The northern part of the krai belongs to the Don Steppe, while southern region's Mediterranean climate has made it a popular tourist location. Novorossiysk is Russia's main port on the Black Sea, one of the few cities awarded the title of the Hero City, and Sochi was host of the XXII Olympic Winter Games in 2014. Krasnodar Krai is home to significant infrastructure of the Russian Navy's Black Sea Fleet. Krasnodar Krai is located in the southwestern part of the North Caucasus and borders with Rostov Oblast in the northeast, Stavropol Krai and Karachay-Cherkessia in the east, and with the Abkhazia region (internationally recognized as part of Georgia) in the south. The Republic of Adygea is completely encircled by the krai territory. 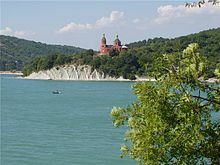 The krai's Taman Peninsula is situated between the Sea of Azov in the north and the Black Sea in the south. In the west, the Kerch Strait separates the krai from the contested Crimean Peninsula, internationally recognised as part of Ukraine but under de facto Russian control. At its widest extent, the krai stretches for 327 kilometers (203 mi) from north to south and for 360 kilometers (220 mi) from east to west. The krai is split into two distinct parts by the Kuban River, which gave its name to this entire geographic region. The southern, seaward part is the western extremity of the Caucasus range, lying within the Crimean Submediterranean forest complex ecoregion; the climate is Mediterranean or, in the southeast, subtropical. Historically it is known as Circassia. The northern part is a steppe zone which shares continental climate patterns. It is also known as Kuban region. The height of the mountains exceeds 3,000 meters (9,800 ft), with Mount Tsakhvoa being the highest at 3,346 meters (10,978 ft). Mount Fisht, at 2,867 meters (9,406 ft), is the Great Caucasus' westernmost peak with a glacier. The Black Sea coast stretches from the Kerch Strait to Adler and is shielded by Caucasus Mountains from the cold northern winds. Numerous small mountain rivers flow in the coastal areas, often creating picturesque waterfalls. Lake Abrau, located in the wine-making region of Abrau-Dyurso, is the largest lake in the northeastern Caucasus region. Lake Ritsa is considered to be one of the most picturesque lakes in the region and "the diamond of Caucasus"; it is located in an intermountain basin at the height of 884 meters (2,900 ft) above sea level. The region's earliest known inhabitants are referred to, generically, as the Maiōtai (after the Greek name for the Sea of Azov). During the 6th century BCE, Pontic Greeks founded the area's first cities, such as Phanagoria (near modern Sennoy) and Hermonassa (on the Taman Peninsula), who traded with nomadic tribes including the Skuthai (Scythians) and Sindi. From the 8th to the 10th centuries, the area was dominated by the Khazars, a Turkic people who had earlier migrated from the east onto the Pontic-Caspian Steppe, where they reputedly converted to Judaism. After the defeat of the Khazar Khanate in 965 Kievan prince Svyatoslav conquered the area, it came under the rule of Kievan Rus', and it then formed the Tmutarakan principality. Later, due to the increasing claims of Byzantium at the end of the 11th century, the Tmutarakan principality came under the authority of the Byzantine emperors (until 1204). In that period of history, the Circassians were first mentioned, under the ethnonym Kasogs. For example, Rededi Prince Kasozhsky was mentioned in The Tale of Igor's Campaign. In 1243–1438 the current territory of the Kuban was part of the Golden Horde. After the collapse of the latter, parts of Kuban were held under the Crimean Khanate, Circassia, and the Ottoman Empire, which dominated the region. The Tsardom of Russia began to challenge the protectorate of the Ottoman Empire in the area during the Russian-Turkish wars. In April 1783, by decree of Catherine II, right-bank Kuban and Taman Peninsula were annexed to the Russian Empire. In 1792–1793 Cossacks moved there from Zaporozhye, now located in Ukraine, and formed the Black Sea Area troops, with the creation of a solid cordon line for the Kuban River and the marginalization of the neighboring Circassians. During the campaign for control of the North Caucasus (Caucasian war 1763–1864) Russia pushed away the Ottoman Empire from the region, followed by elimination of local population (Circassians) as well. For this see Russian conquest of the Western Caucasus. In 1783, the present northern territory of the Kuban region became part of Russia after the liquidation of the Crimean Khanate. A border garrison was located there from 1793 to 1794 in order to protect the Kuban River. The remaining area was relegated to the Cossacks, initiating development of the region. The administrative region was accorded the status of "Land of Black Sea Cossack Army". In 1860, most of the occupied area of the territory of the modern Kuban-Krasnodar region was formed of, and controlled by, remnants of the Black Sea Cossack Host and the western part of the Caucasus Line Cossack Host, who were to become the Kuban Cossack Army. In 1900, the region's population numbered around two million people. In 1913, the gross grain harvest Kuban region entered the 2nd place in Russia, for the production of marketable grain – in the 1st place. Krasnodar Krai was founded on 13 September 1937, when Azov-Black Sea Krai of the Russian SFSR was split up in Krasnodar Krai and Rostov Oblast. During the Soviet period, the high authority in the krai was shared between three persons: The first secretary of the Krasnodar CPSU Committee (who in reality had the greatest authority), the chairman of the Krai Soviet (legislative power), and the chairman of the Krai Executive Committee (executive power). Since 1991, CPSU lost all the power, and the head of the krai administration, and eventually the governor was appointed/elected alongside elected regional parliament. The Charter of Krasnodar Krai is the fundamental law of the region. The Legislative Assembly of Krasnodar Krai is the province's standing legislative (representative) body. The assembly exercises its authority by passing laws, resolutions, and other legal acts and by supervising the implementation and observance of the laws and other legal acts passed by it. The highest executive body is the krai government, which includes territorial executive bodies such as district administrations, committees, and commissions that facilitate development and run the day to day matters of the province. The krai administration supports the activities of the governor who is the highest official and acts as guarantor of the observance of the Krai Charter in accordance with the Constitution of Russia. Krasnodar Krai is administratively divided into thirty-eight districts (raions) and fifteen cities of district equivalence. The districts and cities are further subdivided into eleven towns, plus urban-type settlements, and rural okrugs and stanitsa okrugs. Large companies in the region include Tander, Novorossmetal, Autonomous Heat Energy Company, Gazprom gas distribution Krasnodar, Evrokhim Chemical Fertilizers. Several lines of Russian Railways cross the region and link it with Abkhazia, Ukraine, and neighboring Russian regions. There are direct trains from resort cities like Sochi and Anapa to Moscow, via Krasnodar, which become very popular during the summer vacation season. There are also suburb train connections. The Apsheronsk narrow-gauge railway, the longest mountain narrow-gauge railway in Russia, runs through Krasnodar Krai. There are several airports in the region, including Krasnodar International Airport, Sochi International Airport, Anapa Airport, and Gelendzhik Airport. The biggest ports are Novorossiysk and Tuapse. Others are Eisk and Temryuk on the Azov Sea, and Port Kavkaz, Taman, Anapa, Gelendzhik, and Sochi on the Black Sea. There is a Kerch Strait ferry line which connects Krasnodar Krai and Crimea. Population: 5,404,300 (2014 est. ); 5,226,647 (2010 Census); 5,125,221 (2002 Census); 5,113,148 (1989 Census). The population of Krasnodar Krai is concentrated in the Kuban River drainage basin, which was traditionally Cossack land (see History of Cossacks). The Kuban Cossacks are now generally considered to be ethnic Russians, even though they are still an important minority in their own right in the area. Historically, they were considered to be ethnic Ukrainian, and reported their language as Ukrainian in censuses well into the 20th century; this change in identity is due to assimilation and historical persecution of the Kuban Cossacks, which was particularly prominent due to questions of their loyalty to Moscow and the Communist state during the Russian Revolution and First World War. Other notable ethnic groups are the Adyghe, who have lived in the Kuban area for thousands of years, and the Armenians (including Christian Hamsheni and Cherkesogai), who have lived in the region since at least the 18th century. 101,657 people were registered from administrative databases, and could not declare an ethnicity. It is estimated that the proportion of ethnicities in this group is the same as that of the declared group. According to a 2012 survey 52.2% of the population of Krasnodar Krai adheres to the Russian Orthodox Church, 3% are unaffiliated generic Christians, 1% are either Orthodox Christian believers who don't belong to church or members of non-Russian Orthodox churches, and 1% are Muslims. In addition, 22% of the population declares to be "spiritual but not religious", 13% is atheist, and 7.8% follows other religions or did not give an answer to the question. On July 7, 2012, at least 171 people died in Krasnodar Krai, after torrential rains overnight caused the worst flooding and landslides in more than seventy years. Over 280 millimeters (11 in) of rain – the typical amount for a four- or five-month period – was reported to have fallen within forty-eight hours. A local police spokesman stated that most of the dead were in Krymsky District, where at least 159 died when a wave of water 5 meters (16 ft) high swept through the town of Krymsk in the middle of the night. Ten more deaths occurred in Gelendzhik, including five electrocuted when a transformer fell into the floodwater, and two in Novorossiysk. Authorities stated that 17 people had been officially reported missing, and there were fears the death toll would rise further, while medics had hospitalized 210 people, including 16 children. The regional government claimed that over 24,000 people were affected by the floods, with more than 3,000 evacuated, and that more than 10,000 rescuers and 140 helicopters were searching for victims and evacuating survivors. In Krymsk, 14 temporary shelters were set up to house around 2,000 evacuees. The transport system in the region was said to have collapsed, while oil shipments from Novorossiysk were halted when the port, located in the lower part of the city, was threatened by landslides. Russia's President Vladimir Putin flew to the area to hold emergency talks with officials in Krymsk, while authorities in Perm Krai dispatched a rescue team to evacuate dozens of children from the region, who had been staying at summer camps on the Black Sea coast. Residents of Krymsk claimed the wave of water that hit the town resulted from the sluice gates of a nearby reservoir being opened, although this was denied by the prosecutor general's investigative committee. Local prosecutors had earlier confirmed that the gates were opened, but stated that it was too early to determine whether this was the cause of the flooding. ^ "Krasnodar Territory Industries". investinregions.ru. Retrieved November 7, 2018. ^ Перепись-2010: русских становится больше. Perepis-2010.ru (2011-12-19). Retrieved on 2012-07-07. ^ Население Краснодарского края в 2008 году увеличилось на 0,4% - Новости России - ИА REGNUM. Regnum.ru (2009-02-19). Retrieved on 2012-07-07. ^ a b c d e f "Russia Flash Floods: 144 Killed in Krasnodar Region". BBC News. London. July 7, 2012. Retrieved July 7, 2012. ^ a b c Elder, Miriam (July 9, 2012). "Russian Floods Kill 150 and Leave Thousands Homeless". The Guardian. London. Retrieved July 9, 2012. ^ a b c d e f g h "Over 170 Killed as Tsunami-like Flood Hits Southern Russia". Russia Today. Moscow. July 7, 2012. Retrieved July 7, 2012. ^ a b c d e "Over 100 Die in Russia as Floods and Landslides Hit Krasnodar Region". The Guardian. London. July 7, 2012. Retrieved July 7, 2012. ^ a b "Vladimir Putin Flies to Flood-hit Southern Russia as Death Toll Rises". The Guardian. London. July 8, 2012. Archived from the original on July 10, 2012. Retrieved July 9, 2012. Законодательное Собрание Краснодарского края. Закон №5-КЗ от 5 мая 1995 г. «О символах Краснодарского края», в ред. Закона №2957-КЗ от 8 мая 2014 г. «О внесении изменений в Закон Краснодарского края "О символах Краснодарского края"». Вступил в силу 31 мая 1995 г. Опубликован: "Кубанские новости", №87, 24 мая 1995 г. (Legislative Assembly of Krasnodar Krai. Law #5-KZ of May 5, 1995 On the Symbols of Krasnodar Krai, as amended by the Law #2957-KZ of May 8, 2014 On Amending the Law of Krasnodar Krai "On the Symbols of Krasnodar Krai". Effective as of May 31, 1995.). «Устав Краснодарского края», в ред. Закона №2870-КЗ от 30 декабря 2013 г «О внесении изменений в Устав Краснодарского края». Опубликован: "Кубанские новости", 10 ноября 1993 г. ( Charter of Krasnodar Krai, as amended by the Law #2870-KZ of December 30, 2013 On Amending the Charter of Krasnodar Krai. ). Горшенёв, М. А. (1983). Путешествия по Краснодарскому краю (in Russian). Физкультура и спорт. Wikivoyage has a travel guide for Krasnodar Krai. Wikimedia Commons has media related to Krasnodar Krai.